With all the sculpting that I do, I've developed a way to turn simple cardstock into plasticard and make a very sturdy base for me to sculpt on when I need it. Using plasticard and greenstuff is an art. Some folks do it better than others... I'm not one of those and that's how this trick came about. I've been asked before how I do this particular thing and I figured it was time to show exactly what I do to make the change from cardstock to plasticard. When it comes to cardstock, I prefer the simple stuff like a regular index card. You can use posterboard if you want, you just need to make sure it's not the glossy kind or that it has any kind of coating to it. You want the stuff that will absorb liquid. As for the superglue, I use the cheap stuff myself. The trick though is getting a kind that is like water. You want it to be very runny and nothing like a gel. You want to be able to apply it to the cardstock and have it be absorbed into it easily. While I'm sure there are more uses, I tend to focus on just a couple of things. Purity seals (the long flowing kind), and support structures for when I sculpt things like tabards. Those are the two main things. 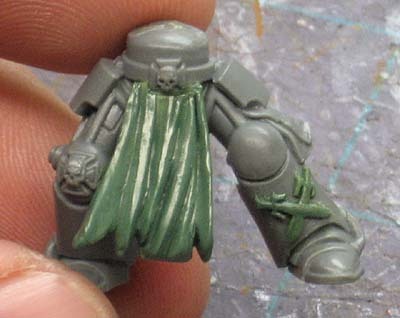 I also use this approach when I'm building armour plates like my Pre-Heresy Terminator shoulderpads and greaves. In the case of things like purity seals, I simply cut out the shape I want, bend it into position carefully and then attach the piece to the model with a tiny drop at the connection point. Once it's secured, I go through and "coat" the cardstock with superglue by adding a few drops here and there and allowing them to absorb into the cardstock. When it comes to tabards, it's the same thing. 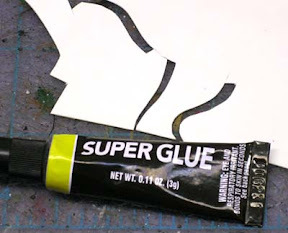 Cut your cardstock to shape, attach it to the model and then coat with glue. I usually only coat one side of the cardstock and that's the side I'll be applying the greenstuff or any paint to. The other side is left alone. It can still be worked on since the glue has soaked through the cardstock and solidified the whole thing. The big thing is applying too much superglue. This only matters on things like the purity seals since too much superglue will dry and once the cardstock has absorbed all it can, the rest will pool up on the surface creating unwanted texture. In the case of half tabards, it doesn't matter since you'll be covering the whole thing with greenstuff anyway. The second problem comes when you rush the drying. Don't mess with the superglue as it's drying or you run the risk of pushing it around on the surface and creating waves of texture. The idea is for all the glue to absorb and leave a smooth surface you can work over it without having to worry about the water in your paints affecting the cardstock underneath and eating away at the stability of your model. And there you have it, how to take regular index card (cardstock) and turn it into "plasticard" so that you get the rigidity and support you need in the end while keeping the flexibility and ease of working with cardstock in the beginning. I've seen this done before somewhere, though I don't remember ever trying it myself. It's a very good idea, another powerful tool in the box. It clearly makes getting complex structures much easier. I don't comment here much because there's little I can add, but I'd like to say that what you do with these posts is a great service. I never thought to use card stock in this way- thanks for posting! Porky: No worries mate, lots of folks lurk each day. Thanks for the kind words, it's nice to know these kinds of things help. deathkorps: Necessity is the mother of all invention they say. I needed something and this is what I came up with way back when. I'm sure I'm not the first person to do it, I'm just sharing what helps me. This is by far the most useful article for me that you have ever done. Within memory at least. I've got something in mind already. Great post! Way beyond my skillset. Something to look forward to in the future though. For the time being I think kitbashing and modifying existing plastic is my best bet. For cheap plasticard you can also buy For Sale signs available at any Walmart or general store. Walmart has them for just over $2 for a square 30 x 20". This is pretty neat though. Never saw this before and I'll definitely use it if I'm ever in a pinch for the stuff. Black Matt: And here I thought it would be something that people would tell me they already knew about and I'm just old news. ServvsUmbrarum: Don't underestimate yourself. This is very easy and get make other techniques easier. Krisken: I do the exact same thing. This is for when I want the ability to bend the surface easily and then have it stay in that position once I add the glue. Sometimes plasticard gives me trouble in that respect. I've done this multiple times. 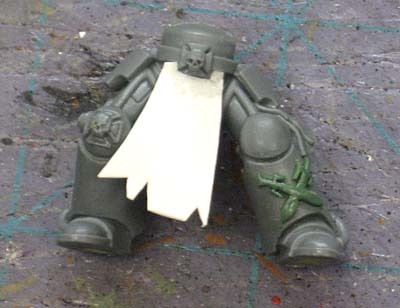 I think I "stole" the idea from you, Ron...waaaaayyyyy back when you had first posted the Heresy Termie shoulderpad tutorial. You applied glues to stiffen the pads and I totally was "this idea is MINE!" I've used it when making neckguards for marines or adding tiny detail plates to terrain or vehicles. Hadn't considered making seals of it...but I probably should have! A very cool method, I may have to give that a go when converting some thing in the future as I don't have a plasticard supplier anywhere local so have to order online. This could save me quite a bit! Andy: While it may not work for everything, when it is applicable, it's the perfect solution. great tutorial. I love your work Ron, I think people like you are what this hobby is all about. keep up the great work. Anon: Thanks, but there are lots of folks doing what I do out there. I'm just sharing the hobby. I was wondering if it was possible to do something like this since I can't seem to find different kinds of plasticard at affordable prices here in Mexico. Anon: You're welcome. If you can't find real plasticard, you can try using the thin plastic signs that you can buy at stores for things like yard sales and such. They don't have the exact same thicknesses as real plasticard, but they work just as well. In fact, it's what I use for my platicard most of the time. 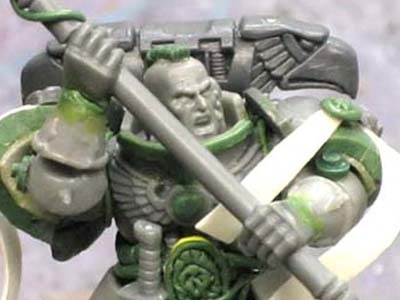 only just found this site and have spent the last few days going over just about every post u have, loving it, inspiring me to get back into the hobby. Anon: Thanks for the comment and I'm glad the site has proved helpful. I never thought about ice cream tubs. I have heard about folks using parts of plastic blisters (or clamshells now).